'Social Approach, this is TransPacific 545. We have an emergency.' The pilot requests priority clearance to land - then comes the bombshell - he needs forty ambulances on the runway. But nothing prepares the rescue workers for the carnage they witness when they enter the plane. Ninety-four passengers are injured. Three dead. The interior cabin virtually destroyed. What happened on board Flight TPA 545? EXCERPT - She sat with the coffee cup on her lap and realised she dreaded going to the factory. But ofcourse she had to go. Casey pushed the cup away, and went to the bathroom to dress. When she came outside and got into her Mustang, she saw a second sedan pull up behind the first. As she drove down the street, the first car pulled out, following her. So Marder had ordered two sets of guards. One to watch her house, and one to follow her. Things must be worse than she thought. I have taken a break from fantasy reviews since i realised most of you haven't read fantasy other than Harry Potter, Artemis Fowl (sorry, but this doesn't count at all) and Twilight. So for the next few reviews will be of books that i am re-reading for you all. It all starts with one of the many flights of the day. As people prepare themselves for the landing, it nosedives without a warning. With 3 people dead and many others injured, the TransPacific flight is a deathtrap. The makers of the plane, the Norton Company is pretty low financial and is welcoming the sale of 50 N-22 twin jets to China that will save the company. But without finishing the investigation of the accident and providing proof that Norton widebody planes are safe, the Chinese are obviously apprehensive. Enter Casey Singleton, Vice President of Quality Assurance (QA) at Norton. Its upto her and her team to find out what went wrong. The amount of effort Crichton has spent on getting the facts right is unbelievable. 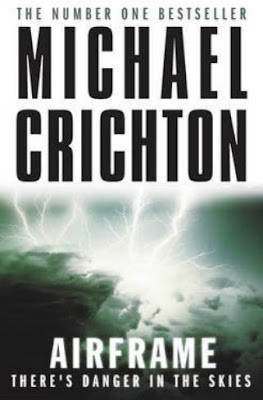 Most of the technical jargon would have gone straight out of my brain, yet Crichton somehow managed to read the minds of the reader and explain the technical know-how in the most simplest of terms. Hell, I feel i know half the language of aviation and aeronautical engineering now. The book follows Singleton as waves and waves of bad news and trouble threaten to disrupt her investigations. The Union disputes arise. They believe the higher management is selling important parts to Chinese and that will kill the company directly. Add to that, friction in the higher management and a spy among them. Also, there is a pretty annoying reporter Jennifer Malone who gets on my nerves. As the investigation progresses, Casey realises there is more at stake that that meets the eye. Including a rumour about Koreans foraying into the midst. And Casey has exactly one week to prove the plane is safe and save her job and life from the frequently growing accidents. Amazing writing by Crichton. Though not his best work, this is still a stellar example of his brilliance. Having read one Chrichton book .. I know what his books offer ! And yes, they are right on the facts , right on for the thrill and a page turner sort .. must pick another of his book soon ! @MSM maybe i have read that book. Sounds to me like Prey or State of Mind. Have to reread those books again. yeah...facts i can handle...its the darn statistics he comes up with thats mind-boggling.